Paul Feliciano (a) rode Secretariat at his first two starts at Aqueduct. Eddie Maple took the ride in the Canadian International. 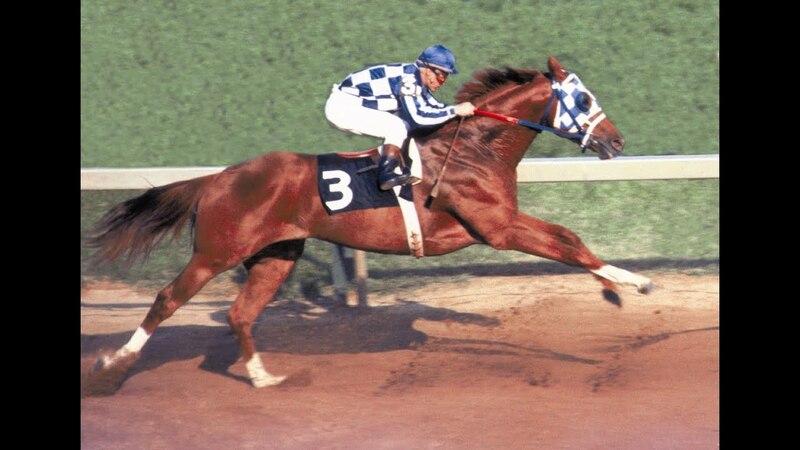 Ron Turcotte rode Secretariat at all his other starts. 1972 Champion Two Year Old Colt & Horse of the Year. 1973 Triple Crown Winner, Horse of the Year, Champion Three Year old Colt, & Champion Turf Horse. Set World Record of 2:24 for 12f on dirt in winning the Belmont Stakes by 31 lengths. 1978 Leading Sire of Two Year Olds. Euthanized on October 4, 1989, due to laminitis. Buried at Claiborne Farm, where he stood his entire stud career. 131 starts, 35 wins (3 x G1), 33 seconds and 28 thirds. Win % 26.7, Place % 73.3. Earnings USD 918,485. Stymie passed Whirlaway's North American earnings record of USD 561,161 (set 22 June 1943) on 28 June 1947 when he won the Questionaire Hcp at Jamaica, Long Island, New York, USA (earned USD 18,225) to set a new North American earnings record of USD 574,660.00. On 9 October 1947 Armed won the Sysonby Mile (USD 18,600) to take his career earnings to USD 761,500 and in doing so passed Stymie's career earnings record of USD 754,710 set on 4 October 1947. On 25 October 1947 Stymie passed Armed's Noth American earnings record (Armed held the record for just 16 days) when Stymie won the Gallant Fox Hcp at Jamaica, Long Island, New York, USA (earning USD 56,350) to take his career earnings to USD 816,060. Armed never retook the lead (Armed's next start was 31 October 1947 when he ran third and then spelled until the following year). Stymie set a new North American earnings record on 1 October 1949 when he finished second in the New York Hcp at Belmont Park, Long Island, New York, USA to take his career earnings to a North American record of USD 918,485. Stymie retired after that race. Stymie held the North American earnings record for second time from 25 October 1947 until 3 June 1950 when passed by Citation. As noted below Stymie fractured a sesamoid bone in a race on 24 June 1948 however contrary to his Wikipedia page this did not put an end to his racing career as he raced on in 1949 as an 8YO. While Stymie was trained by Hirsch Jacobs in all but his first two starts he had 21 jockeys throughout his career. Earnings for each race appears at the end of each record. Margins are shown for first to third except where Stymie ran fourth in which case the margins are for first to fourth. TWO YEARS: 1943 Starts 28: 4-8-4-12 for USD 15,935. ^ DRF clocked the time as 1.123.2. Note there was a four month US government shutdown on racing in at the beginninning of 1945 to concentrate of the war effort. # DRF clocked the time as 1.46.2. ## DRF clocked the time as 1.44.0. ^^^ DRF clocked the time as 1.43.6. ^^ DRF clocked the time as 1.49.2. * Fractured a sesamoid bone in this race however contrary to his Wikipedia page this did not put an end to his racing career as he raced on as an 8YO. EIGHT YEARS: 1949 Starts 5: 0-1-2-2 for USD 7,150. Sun Beau passed Gallant Fox's North American earnings record of USD 328,165 set 17 September 1930 when he won USD 27,300 for first in the Arlington Hcp run at Arlington Park, Chicago, Illinois, USA on 1 August 1931 taking Sun Beau's career earnings to USD 330,044. Sun Beau retired after winning the Hawthorne Gold Cup run at Hawthorne, Chicago, Illinois, USA on 8 October 1931 (winning USD 20,700) with career eanings of USD 376,744 a North American record. He won that race three times and it is currently a G2 race. Sun Beau held the North American earnings record from 1 August 1931 until 2 March 1940 when passed by Seabscuit. After Phar Lap's win in Mexico Australian newspapers made much of the posssibilty that Phar Lap would pass Sun Beau's world earnings record if his form continued in the USA (see digitised newspaper reports available through National Library of Australia (nla.gov.au)). That did not happen as I believe foreign interests (possibly from Area 51) ended Phar Lap's career. In Phar Lap's case the dingo is innocent. Interestingly while researching the US racing record of Ponder I discovered that DRF had a tipster who used the pseudonym Phar Lap. Phar Lap's win in Mexico was on 20/03/1932, according to DRF took, his career earnings to USD 332,250. I note that Phar Lap's first in Mexico was worth USD 50,500 (my figure, not USD 50,050 as usually reported). 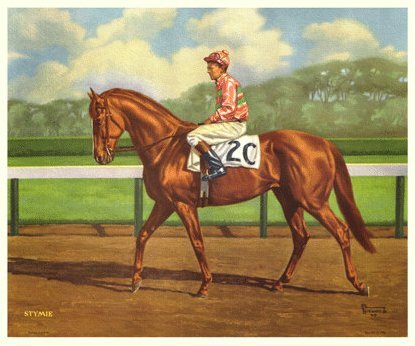 It folllows that according to DRF Phar Lap was within USD 44,494 of Sun Beau's world earnings record at the time of his death. 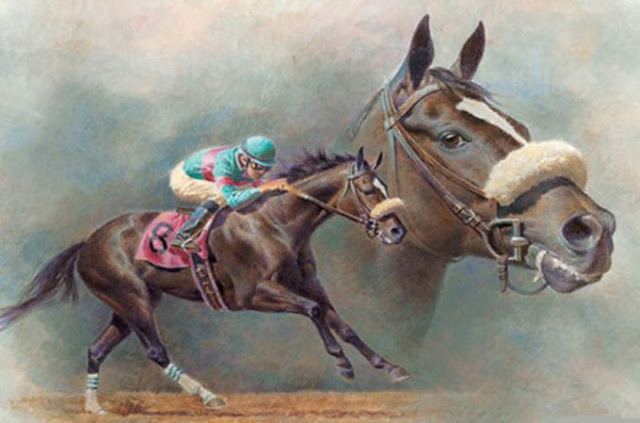 In 1996 Sun Beau was inducted into the USA National Museum of Racing and Hall of Fame. Amount earned at each start appears at the end of the racing record for each race. Prizemoney earned for each race appears at the end of each race start. Included in the USA National Museum of Racing and Hall of Fame (view at https://www.racingmuseum.org/hall-of-fame/horses; located at Saratoga Springs, NY). Beaten by Seabiscuit by four lengths at only clash in the winner take all Pimlico Special of 1938. Interestingly the USA National Museum of Racing and Hall of Fame lists over 200 horses in its hall of fame. Daily Racing Form (via the American Racing Manual (2005 edition)) was quite restrained by comparison listing only 29 horses as worthy of being 'Great Horses of the 20th Century' and War Admiral was not one of them. * Weight of 106lbs may be a typo. Retired because of an ankle injury. 43 starts, 23 wins, 8 seconds and 5 thirds. Win % 53.5, Place % 83.7. Earnings USD 313,639.00. Zev passed Man o'War's North American record career earnings of USD 249,465 (set 12 October 1920) when Zev won USD 80,000 for first in the International Race at Belmont, Long Island, New York, USA, on 20 October 1923 to set a new a North American record of USD 255,513. 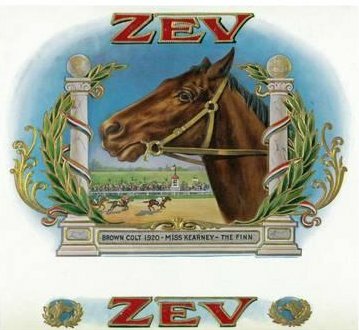 Zev passed Isinglass (GB) 1890 world record earnings of £58,655, estimated as equivalent to USD 285,814.63, (set 20 June 1895) on 17 November 1923 when Zev won a match race at Churchill Downs, Louisville, Kentucky, USA earning USD 25,000 to take Zev's career earnings to USD 296,673 to set a world earnings record in USD. Zev retired after finishing third in the Pimlico Fall Serial Weight-For-Age Race No 2 at Pimlico, Baltimore, Maryland, USA on 8 November 1924 (earning USD 250) with career eanings of USD 313,639 a North American and world record. Zev held the North American earnings record from 20 October 1923 until 6 September 1930 when passed by Gallant Fox. Zev held the world earnings record from 17 November 1923 until 6 September 1930 when passed by Gallant Fox. USD earnings for each race a set out at the end of each race record. TWO YEARS: 1922 Starts 12: 5-4-2-1 for USD 24,665.00. THREE YEARS: 1923 Starts 14: 12-1-0-1 for USD 272,008.00. * Before 1932 the Preakness Stakes was run before the Kentucky Derby on 11 occasions and twice on the same day (wikipedia). FOUR YEARS: 1924 Starts 17: 6-3-3-5 for USD 16,966.00. 17 starts, 11 wins (5 x G1), 3 seconds and 2 thirds. Win % 64.7, Place % 94.1. Earnings USD 328,165.00. Gallant Fox passed Zev's North American career earnings record (set 12 October 1923) when he won USD 29,610 for first in the Lawrence Realization Stakes at Belmont Park, Long Island, New York, USA, on 6 September 1930 to set a new a North American record of USD 317, 865. Gallant Fox retired after winning the Jockey Club Gold Cup at Belmont Park, Long Island, New York, USA, on 17 September 1930 (earning USD 10,300) with career earnings of USD 328,165 a North American record. Gallant Fox held the North American earnings record from 6 September 1930 until 1 August 1931 when passed by Sun Beau. TWO YEARS: 1929 Starts 7: 2-2-2-1 for USD 19,890.00. THREE YEARS: 1930 Starts 10: 9-1-0-0 for USD 308,275.00. First winner of British Triple Crown 35 years. Sired 155 stakes winners, three Epsom Derby winners. Only sire to have a winner of the Kentucky and Epsom Derbys in the same year. Died (1992) from laminitis; buried at Claiborne Farm, Kentucky, USA. Eclipse Champion Older Female, 2008, 2009 & 2010. 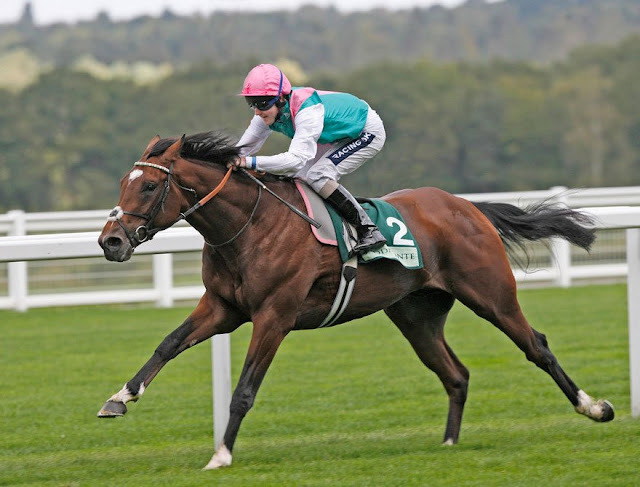 Horse of the Year, 2010. Wasn't Man O' War's victor in his one defeat appropriately named? Looking through the other races in MOW's career the abovementioned could have been named Price Darius. Ribot was bred by Italy's leading Thoroughbred breeder, Federico Tesio, who personally bred six of the horses that appeared in the first three generations of Ribot's pedigree. Ribot was foaled at the English National Stud at Newmarket, Suffolk on 27 February 1952. He was described as being a "medium-sized bay with a lovely intelligent head and a perfect temperament. The secret of his success was probably his depth through the heart and there was not a girth at Dormello to fit him." Ribot won his 16 races by a cumlative margin of 99+ lengths with an average winning margin of more than 6 lengths. Retired from racing, Ribot had an exceptionally successful career at stud. Under a one-year contract, he first stood at Lord Derby's stud in England. In 1959, he was syndicated for a five-year lease at a cost of $1.35 million before being sent to the United States. After his temper surfaced, no insurance company would offer a policy to cover shipping him back to Europe. A new contract was worked out, and Ribot remained in the United States until his death. He is buried in the equine cemetery at Darby Dan, near his sons Graustark and His Majesty. He was leading sire in Great Britain and Ireland on three occasions (1963, 1967 and 1968). His European progeny included Molvedo and Prince Royal, both winners of the Prix de l'Arc de Triomphe; Ragusa, winner of the Irish Derby, St. Leger, King George VI & Queen Elizabeth Stakes, and Eclipse Stakes. 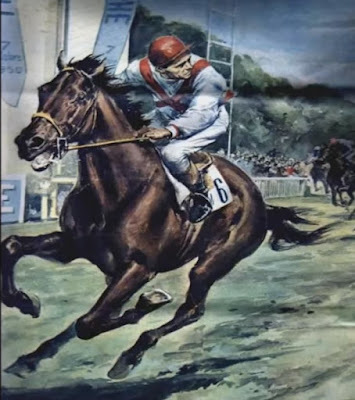 In America he sired Long Look, winner of Epsom Oaks; the full brothers Ribocco and Ribero, both winners of the Irish Derby and St. Leger; Boucher, the winner of the 1972 St Leger; Tom Rolfe, winner of the 1965 Preakness Stakes; Arts and Letters, winner of the 1969 Belmont Stakes; and Graustark. Ribot's son His Majesty sired the Kentucky Derby and Preakness Stakes winner Pleasant Colony, and his great grandson Alleged, by Tom Rolfe's son Hoist The Flag, emulated him by winning the Prix de l'Arc de Triomphe in succssive years (1977 and 1978). It was said he was "the fleetest horse that ever ran at Newmarket or, as generally believed, that was ever bred in the world". He is reputed to have run a mile against Almanzor in a minute flat, a patently absurd claim but which has endured for almost 300 years. He was the first truly famous racehorse in Britain where several pubs were named after him. 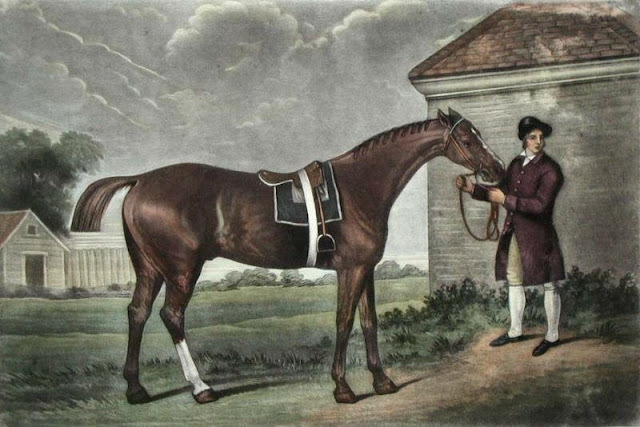 His full brother Bartlett's (or Bleeding) Childers was the grandsire of Marske, the sire of Eclipse, while Flying Childers stood at the Duke's Chatswood estate in Derbyshire until his death in 1741 at the age of 26. He sired Snip, the sire of Snap and was the dam sire of the grand stallion Herod. 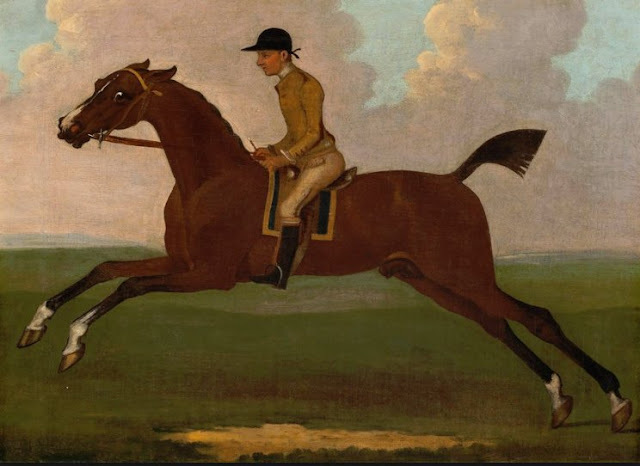 Eclipse was foaled during and named after the solar eclipse of 1 April 1764, at the Cranbourne Lodge stud of his breeder, Prince William Augustus, Duke of Cumberland, otherwise known to the Scots as 'The Butcher of Culloden'. After the death of Cumberland in 1765, Eclipse was sold for 75 guineas to a sheep dealer from Smithfield, William Wildman. Eclipse was a bright chestnut with a narrow blaze running down his face. He had a white stocking on his right hind leg. Eclipse was a big horse for his time, just over 16 hands (64 inches, 163 cm), and was an inch higher at the rump than at the withers. His difficult temperament was well documented, and might have led to him being gelded. Instead he was put to work until he was a five year old. Rather than souring his disposition, Eclipse settled enough to allow him to be raced, although his jockeys never attempted to hold him. After his second victory in a race in May 1769, Dennis O'Kelly purchased Eclipse from Wildman. Supposedly, at this time O'Kelly used the famous phrase "Eclipse first and the rest nowhere," when making his bets for this race. At that time, a horse that was more than 240 yards behind the lead was said to be nowhere. Eclipse won the race and covered O'Kelly's bet. The rest were distanced. 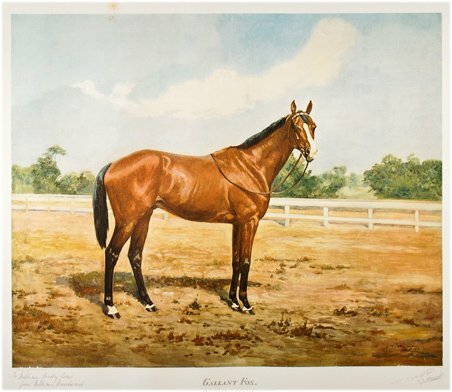 During his racing career, Eclipse ran over 63 miles and walked 1,400 miles to race meetings across England. In 1771, Eclipse was retired to stud after a racing career of about 17 months due to lack of competition as nobody was betting on rival horses. Initially he stood at O'Kelly's Clay Hill Stud, near Epsom (Surrey), for a fee of 10 guineas which rose rapidly to 25 and then to 50 guineas a mare. During 1788, he was relocated to Cannons Stud, Edgware (Middlesex). 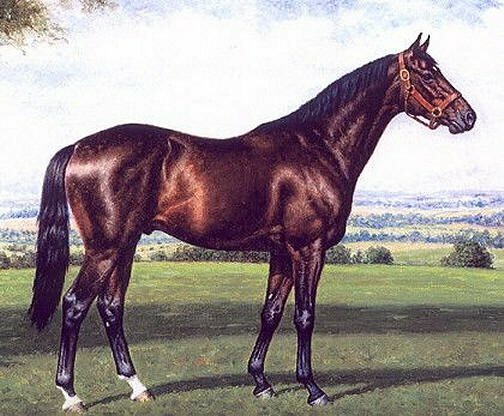 Eclipse was never the leading sire in Great Britain and Ireland, although he finished in second place 11 times, usually behind Herod. It has been estimated that Eclipse is not only somewhere in the pedigree, but a tail-male ancestor of "95% of contemporary thoroughbreds" or of "nearly every living thoroughbred." Eclipse died due to an attack of colic on 27 February 1789, at the age of 24. His skeleton is now housed at the Royal Veterinary College, Hertfordshire, in the Learning Resource Centre named after him, although it cannot be said for certain whether all the bones displayed are really from Eclipse. His hooves were made into inkstands, although the fact that there are at least five Eclipse-hoof inkstands casts some doubt on the authenticity of some. I have inserted a 'Record compiled by timw' on each of the records you have contributed to this thread. When I copied them over it gave the impression that I was the author of the post so I needed to correct that. I have been adding some dinosaurs and all the records of internationals that were originally posted on the Miller's Guide site. If you have any better records of the same horses (and I do regard yours as good as its gets) don't hesitate to post them. As we did with Cigar, I will supersede the Miller's record with yours. The dinosaurs are my weakness and there are a few to come - Highflyer, Lexington, Ormonde, Colin, Nearco. I have chosen them simply because their records are detailed on Wikipedia and can be easily reproduced here. I am also considering putting up the profiles of the thoroughbred foundation sires. Can we do my favourite boy - Brigadier Gerard? Also like to see probably the greatest of all time; Seabird. Its hard to get detailed info on Europeans even if they raced exclusively in one country. We are lucky here because we had Pring and some others covering Aust and NZ and in the US we have DRF. Post circa 1990 a lot of stuff was put on the internet (post the Brigadier and Sea Bird) however that stuff is now being put behind pay walls and while I used to find gaps in the past it is now getting harder as they work out what was left open and close it off (I am no geek so while geeks might crack them I cant). You can try and get the stuff yourself by searching eg the London Times online thru National Library of Australia membership which is not really a racing paper but does have results from the major racecourses (once you get a membership card you can use the card number to access the paper online). I have bought a few books from UK but while most are a good read none have the detail of Pring et al. What I need to do is get back to London and Paris and spend some time there looking thru copies of racing calendars and stuff. Donations encouraged as I do not intend to slum it. Oh I have the quintessential book on Brigadier Gerard. I know his record intimately. Just thought it needed to be highlighted here. He only met Mill Reef once - and beat him. Mill Reef himself deserves a spot here. The Brigadier's only defeat came at the hands of Roberto, and Roberto was pretty good himself. Many people consider Seabird the greatest horse of all time anywhere. His Arc win is generally noted as the best Arc field of all time. I think he won by 6 from memory. Hopefully this is readable on your devises. HER 26 consecutive wins is a national record and trails only Puerto Rico’s Camarero with 56 successive wins and unbeaten Hungarian mare Kincesm (54 wins). I believe he was a drug runner and very hard to catch. Camarero won $43,553 in stakes from 73 wins 2 seconds from 76 starts. Do the math and that equals around $600 per race - despite the fact that he won the Puerto Rico Triple crown and all the other feature races on the calendar. By comparison the racing elsewhere in the United States Puerto Rico is little better than our picnics. To further underline that point more than 400 horses a year are executed at a clinic behind the grandstands at the Hipodromo Camarero, Puerto Rico's only racetrack because they too expensive to keep if they are not competitive. (see http://www.espn.com.au/sports/horse/news/story?id=3398860). All horses are sourced from the USA. They race 5 days a week at Hipodromo Camarero with a pool of around 1500 horses who are all stabled at the track. To further underline this point Camarero had 76 starts but died when he was just 5 years of age. 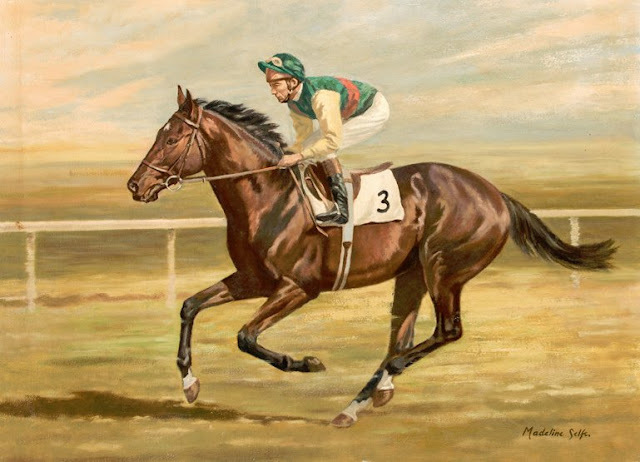 Nearco's dam was the excellent racemare Nogara, who had won the Italian 1000 and 2000 guineas and was Italian champion filly at ages two and three. In 1934, Tesio wished to breed Nogara to the leading English sire Fairway, but was unable to obtain a nomination. Therefore, Tesio chose to breed Nogara to Fairway's full brother, Pharos. Nearco stood just over 16 hands (64 inches, 163 cm) and had nearly perfect conformation. He was known for his fiery temperament and explosive turn of foot, traits he passed on to many of his descendants. After retiring to stud, Nearco could only be handled by his groom Ernie Lee. Tesio tried to sell Nearco at two, believing that the colt would not have enough stamina to last the classic distances. Italian champion three-year-old and Horse of the Year of 1938. Tesio later wrote in his stud book, "Not a true stayer, though he won up to 3,000 meters... He won these longer races by his superb class and brilliant speed." Nearco retired undefeated after 14 races. With the political turmoil and the possibility of war caused by Benito Mussolini aligning Italy with Nazi Germany, Federico Tesio sold Nearco in 1938 to Martin H. Benson of Beech House Stud in Newmarket, England, for £60,000 (a world record for a sire in those days; equal to about £3.5 million in 2016). The potential importance of Nearco's progeny was forecast in the provision of a bomb shelter to ensure his survival should London be subject to an air raid. Nearco was one of the top 10 sires in England for 15 years. He was the leading sire in Great Britain and Ireland in 1947 and, depending on the source, either 1948 or 1949 or both. From 482 named foals, he sired 273 winners (56.6%) and 87 stakes winners (18.0%). FLYING FOX: The eighth British Triple Crown winner. On the death of the 1st Duke of Westminster in 1900, Flying Fox was submitted to auction at Kingsclere, fetching an unprecedented 37,500gns. His sale price remained a British auction record for a horse in training for 67 years. I wonder how one would quantify a true stayer ? The very best horses in Europe no longer venture past 2400m. The staying races are left to those who are not quite fast enough for 2400m or rarely they are. We did see the wonderful Order Of St George run 3rd in an Arc, but his best contemporary's are not asked to test him over his trips.